Relative sizes of ticks at different life stages. A female black-legged tick spotted at VanBuren State Park in May 2012. A male black-legged tick as seen at VanBuren State Park in May 2012. Time to break out the long pants: tick season is back! The past couple of years we've had a tick boom along the west side of the state and it's happening again this year. Rich Keith spends a lot of time with ticks. He’s the director of the Kalamazoo Valley Bird Observatory. He and his wife Brenda have been doing tick surveys every year since 1997 for university researchers in Michigan and elsewhere. "In 2003-2007, it was documented that a new expansion of the blacklegged tick came up from northern Indiana all the way to Sleeping Bear Dunes," says Keith. Rich Keith talks about ticks on the west side of the state. Last year around this time, I spoke with Erik Foster, the medical entomologist with the Michigan Department of Community Health. Foster says reported Lyme disease cases rose from 98 in 2012 to 165 in 2013. Learn about your risk for Lyme disease. Foster says the primary symptoms of Lyme disease include a febrile illness. “So this would be fever, headaches, malaise, swollen lymph nodes. It might also include joint pain and swelling and muscle pain," he explains. But he says the most obvious symptom associated with Lyme disease is the "erythema migrans" or "bullseye rash." This non-itchy, reddish rash expands out from the site of where the tick bites after a few days. According to the CDC, it occurs in 70-80% of people infected with Lyme disease. Foster says if you have an onset of these types of symptoms in the summer months and you know you've been to an area where these ticks occur, go see a health care provider. Early treatment for Lyme disease is essential in making sure that you go through a full recovery. 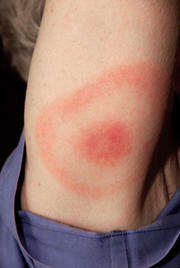 One symptom of Lyme disease is a 'bullseye rash' at the site of the tick bite. How concerned should you be about tick bites? Lyme disease is a bacterial infection and not every tick is infected. 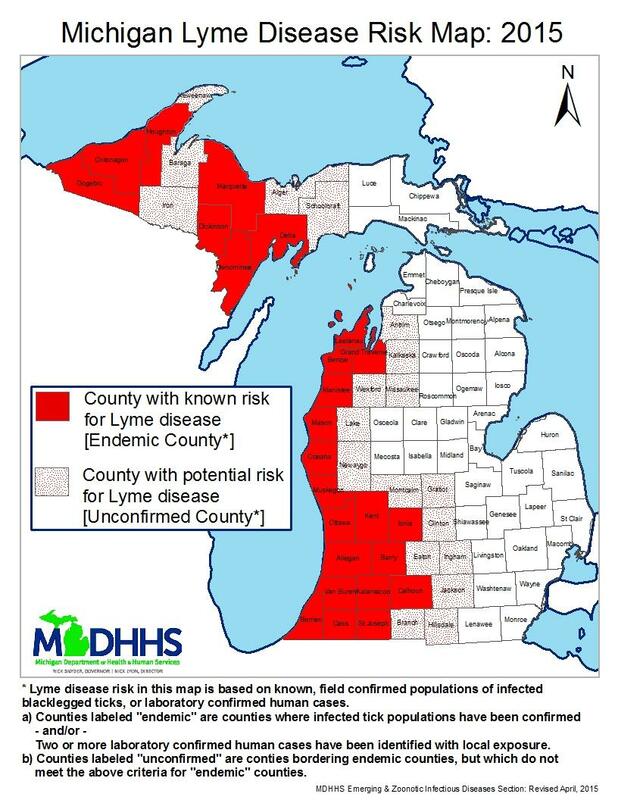 "Really it is only the blacklegged tick in Michigan that transmits Lyme disease and there's only a certain percentage of these ticks that are even infected with the bacteria," said Foster. He says studies in Michigan show about 15-25% of blacklegged ticks in the nymph stage and 40-45% of adult blacklegged ticks are infected. The number one way to reduce one's risk of contracting the illness is to avoid tick bites. Foster recommends wearing EPA-approved insect repellents that contain DEET, picaridin or oil of lemon eucalyptus. When in the woods or other tick-prone areas, wear long pants and tuck those pants into your socks to reduce the risk of ticks crawling up your pant leg. Foster also recommends hiking in the center of trails to avoid brushing up against plants on the edges where ticks like to hang out. “Secondly, doing a tick check on your family members and taking a shower soon after coming indoors will help to wash off ticks that may have not bitten you yet,” he says. He says if a tick is attached to your body for less than 24 hours, your chance of getting Lyme disease is very small. But Foster warns that this time of year, you need to really look carefully when you’re doing a tick check. Find out where you have the highest risk of encountering ticks that can transmit Lyme disease. “The blacklegged tick stage that is out there – in the wild – that's coming up right now is called the nymphal-stage tick and it is very, very small, about the size of a poppy seed," says Foster. "So a lot of times people don't see these when they're climbing on their bodies and you don't feel them bite you." He recommends checking all over your body for ticks, paying special attention to certain areas of your body where ticks commonly bite: behind the knee, the waistline, groin, armpits, behind the ears, around the neck and in the hairline. Kim Signs with MDCH says you can do a tick check on your dog or cat. Ticks especially like to hang out around the ears and in between the toes. She recommends talking with your vet about ways to keep ticks off your pet in the first place. Signs says that dogs are susceptible to Lyme disease but there’s a vaccine for them. She says it can be hard to tell if your dog has the illness, but it can cause fever and swollen joints. So, if you notice changes in your dog’s behavior, she says it’s a good idea to take it to the vet. The state of Michigan's Emerging Disease site has updated its brochure, Ticks and Your Health, in an effort to inform residents about the dangers of tick bites. You can also check out the CDC's tick site for more info. On today's Environment Report, we talked about ticks. Michigan State University entomologist Howard Russell told me that tick season is booming in Michigan this year. And the boom is happening in areas where ticks were relatively rare a few years ago. Blacklegged ticks – formerly known as deer ticks - are historically rare in the Lower Peninsula. But over the past decade, that’s been changing. The tick population is booming along the west Michigan shoreline. Erik Foster is a medical entomologist with the Michigan Department of Community Health. He’s been studying the tick population as it’s been moving north. He says the Lake Michigan shoreline is a good habitat for ticks. Foster says because the winter was so mild, more mice and chipmunks survived. Those animals are hosts for ticks, and that means more ticks made it through the winter too. He says deer and birds are also hosts for ticks, and they're transporting the insects north. Foster says blacklegged ticks can transmit Lyme disease. He recommends wearing insect repellant that contains DEET and checking yourself and your pets for ticks after you walk in tall grass or in the woods. You can learn more about ticks in this document from the state of Michigan: Ticks and Your Health. Tens of thousands of Michiganders will spend this holiday weekend camping or just going for a long walk in the woods. But state health officials are warning that you may come into contact with ticks. If you’re doing anything outdoors this holiday weekend—from camping to gardening in the backyard—you should be on the lookout for ticks and mosquitoes. Public health officials warn that tick populations are booming throughout the state this season. “We’ve seen a lot of tick activity increase in the last couple of weeks,” says Angela Minicuci, Public Information Officer with the Michigan Department of Community Health. Whether you’re in a grassy area like a park or out in the woods, ticks can be hanging around. There are two key ways to guard against them.